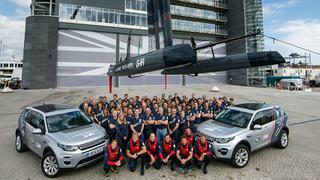 Jaguar Land Rover and Ben Ainslie Racing (BAR) have joined forces to help to bring the America’s Cup back to Britain. The global partnership which sees Jaguar Land Rover become BAR’s title and exclusive innovation partner was announced at the newly operational home of BAR in Portsmouth this morning (June 24). The new collaboration will see Jaguar Land Rover’s engineers and designers working closely with the team to provide race-winning technology. 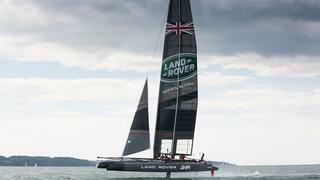 Ben Ainslie said he was “delighted” to be working with Jaguar Land Rover. “A great British brand, but also a fantastic engineering and technology company who will work hand in hand with our design and engineering team, and our Technical Innovation Group,” Ainslie said. “Together we will develop race-winning technology for our America's Cup Class boat." The car manufacturer’s advanced engineering team has already started work on a number of design challenges. Mark Cameron, Jaguar Land Rover global experiential marketing director said: "At Land Rover we have a long history in sailing. This incredible partnership with BAR has given us the opportunity to showcase our world class expertise in advanced engineering and innovative technologies which lie at the heart of everything Land Rover does. “Yes, we make cars, but we will make a real difference to the performance of the Land Rover BAR team and we will help create the fastest boat possible in the hope of bringing the America's Cup to the UK for the first time." The 35th America's Cup will be hosted by Bermuda in 2017 and BAR was the first team to practice there. The team willl start their America’s Cup challenge – representing Royal Yacht Squadron Racing – at the Louis Vuitton America's Cup World Series Portsmouth, next month (23-26 July).